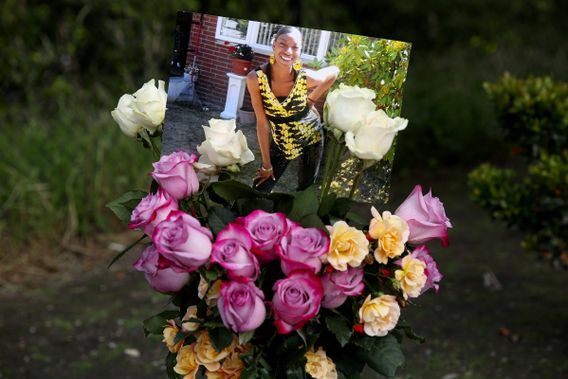 A civil lawsuit was filed Friday against the two Seattle police officers who fatally shot Charleena Lyles in June. Attorneys representing Lyles’ estate say the suit is in response to the Seattle Police Department’s failure to release additional information about the shooting. 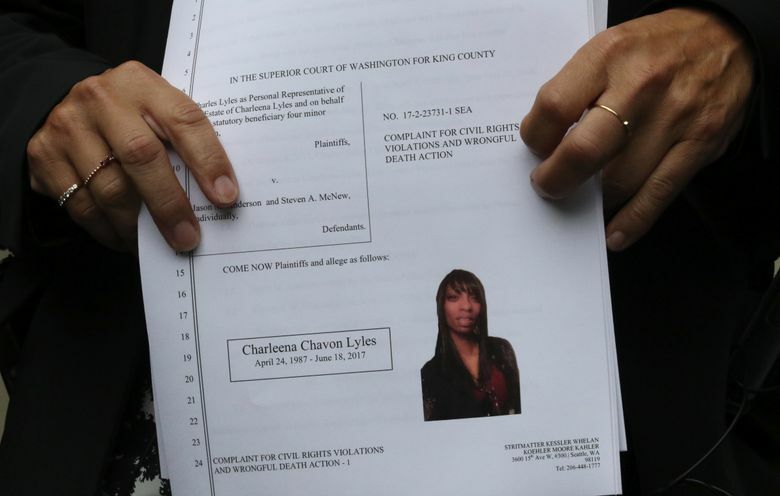 Attorneys representing the estate of Charleena Lyles filed a civil lawsuit Friday against the two Seattle police officers who fatally shot the pregnant mother of four in her Magnuson Park apartment in June. The suit alleging civil-rights violations and wrongful death names Officers Steven McNew and Jason Anderson as respondents. They are indemnified as city employees, which means should there be a civil judgment or settlement agreement against them, damages would be paid by the city. During a Friday news conference outside the Seattle Police Department’s Fifth Avenue headquarters, Seattle attorneys Karen Koehler, Ed Moore and Travis Jameson explained the legal maneuver is meant to speed up the clock on getting answers to outstanding questions surrounding Lyles’ death. On Aug. 11, the attorneys filed a notice of claim, which is a precursor to a lawsuit, against the city of Seattle, which still has 32 days remaining to respond before a lawsuit can be filed. Provided the city doesn’t respond to the claim or offer a settlement, the attorneys will add the city as a participant to the lawsuit now underway against the two officers, Koehler said. Meanwhile, the officers will have 20 days after being served with the lawsuit to file their responses — and the earliest they would be subject to video-recorded depositions would be 120 days after that, Koehler said. Koehler and her colleagues decided to expedite the process after she said SPD failed to follow through on promises to release additional information about the fatal shooting. The attorneys said they’ve learned SPD has consulted with a variety of use-of-force experts across the country, a clear sign that the department is building its case and intends to fight the suit filed on behalf of Lyles’ four children, ages 1, 4, 11 and 12. “We will not sit idly by while the city hones its defense,” Jameson said. Jeff Wolf, an assistant city attorney, said Friday his office has received the complaint and is reviewing it. An SPD spokesman said Friday the shooting is still under investigation. Koehler, Moore and Jameson represent Lyles’ father, Charles Lyles, who was appointed last month as the personal representative of his daughter’s estate in King County Superior Court. 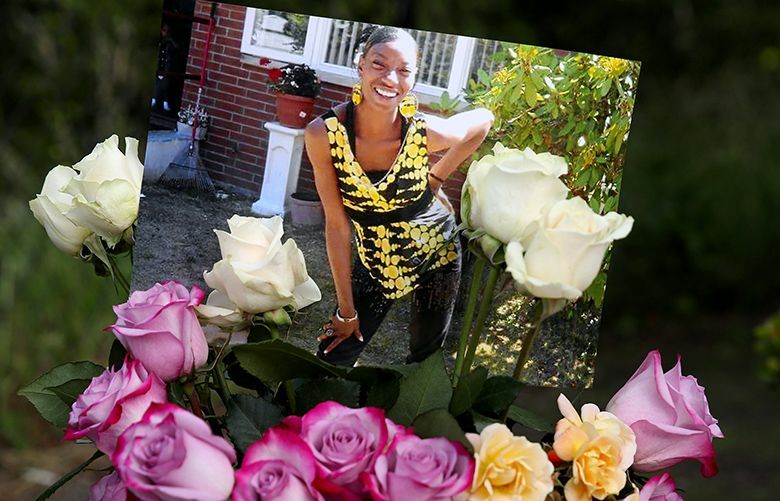 Last week, the attorneys released autopsy and toxicology reports, which showed Lyles was shot seven times and didn’t have drugs or alcohol in her system at the time of her death. The attorneys also announced Friday they would not participate in an inquest into Lyles’ fatal shooting, with Koehler calling it a “sham procedure” that has county officials determining what questions are asked and which witnesses are called to testify. Lyles’ children are in the custody of two other relatives, with the two eldest children and the two youngest now living in separate homes. The children’s guardians are each represented by an attorney for the purpose of the inquest. In a statement Friday, attorney Corey Guilmette, who represents Lyles’ sisters, brother and cousins, said those family members will participate in the inquest, despite their concerns about the inquest process. Lyles’ relatives are scheduled to meet with officials with the King County Executive’s Office next week to discuss inquest reforms, Guilmette said. One of Lyles’ sisters has custody of the two youngest children. “If the family does not participate in the inquest, the public will only hear a one-sided story in the inquest, told by the attorneys representing the officers who killed Charleena,” Guilmette wrote in the statement. James Bible, the attorney representing the paternal grandmother who has custody of Lyles’ two eldest children, did not immediately respond to a request for comment. Lyles, a 30-year-old African American, was fatally shot by McNew and Anderson, who are both white, on June 18. Police say she threatened the officers with at least one knife after calling 911 to report that someone had broken into her apartment and stolen two video-game consoles. But police have said the officers found no evidence of a burglary. Three of Lyles’ children were in her apartment when she was killed. Lyles was four months pregnant at the time of her death, according to attorneys representing her estate. 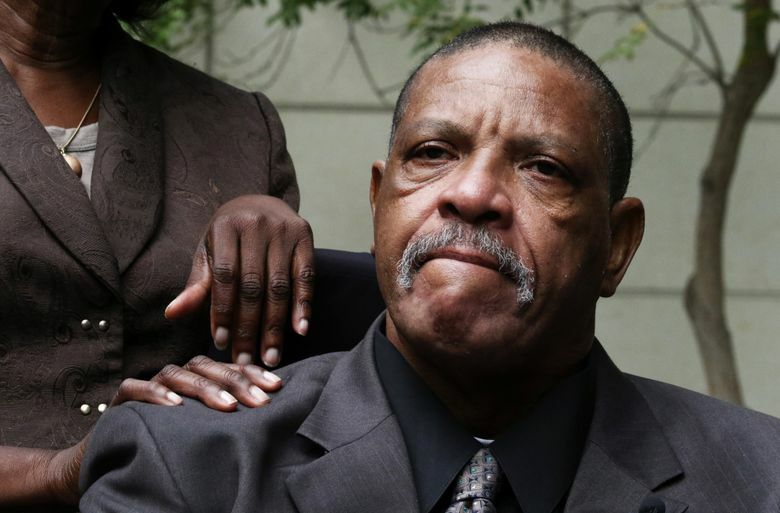 In the week after Lyles was killed, the Seattle Police Department proactively released dashcam footage, video-surveillance footage from Lyles’ apartment, an audio recording of Lyles’ 911 call to report a residential burglary, information about a caution to officers that Lyles had previously been assaultive and threatening to officers, transcripts of statements given by McNew and Anderson, a crime-scene diagram of Lyles’ apartment and photos of the knives found in her apartment. The department also released a 45-page memo answering questions from members of the Seattle City Council, covering a range of topics related to the shooting. Lyles’ family has said the shooting could have been avoided and that they believe race was a factor. But at a news conference last month to announce the filing of the claim, the attorneys declined to discuss what Koehler called Charleena Lyles’ “severe mental-health issues,” though the claim references Lyles’ battle with depression and says she began treatment at Sound Mental Health in summer 2016 after she was arrested for domestic-violence assault following an altercation with her sister in Auburn. Charles Lyles has said any money awarded as a result of the lawsuit would go to his grandchildren.